Californias newcomers HUNTRESS are contenders to the envious spot of the newcomer of 2012. Power and force can be found in most albums I review, but Jill Janus and her female approach to the chartered country of KING DIAMOND sure is interesting enough. The info says it´s epic and timeless, I´ll settle with “like King but without balls”…let´s hear them out! Opener “Spell Eater” wastes no time and displays itself as a speedy track with an arrangement for maximum effect. The well-known voices of the KING are there, backed by real heavy metal. “Senicide” has more of MERCYFUL FATE in its veins, and is augmented by a chanting voice. “Sleep and Death” may well be more KING than the Dane has produced in many a year lately. “Snow Witch” may sport an arch typical title but is remarkably featureless. Most is forgotten as “Eight of Swords” hit my ear phones. 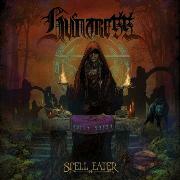 The refrain really lingers and for a change HUNTRESS is more metal than KING or MERCYFUL. The groovy aggressiveness of “Aradia” is also very satisfying, I somehow came to think of HOLY MOSES when hearing the fab riff. The rest of the album never really reaches the heights of the first six tracks, thus rendering the album out of my best of 2012 list. But if HUNTRESS gets the time to conceive and record a follow-up, with some handy record label guidance, I think we´re on to something big here!